Nothing beats a good summer storm. Cracks of lightening, tantrums of thunder, pounding rain that ends with a rainbow, one that arches over roof tops and gardens. After our last storm, a full spectrum rainbow covered the big plot of rainbow chard next door to our house. Owned by Stone's Throw, an urban farming group, the lot is lush with glossy broad leaves on crayon-colored stems -- pink, yellow, pale green, deep rose. Chard is one of summer's mixed blessings -- there's just too much of it right now. When I'm overwhelmed with abundance, I'll arrange it into a flower bouquet and use it to garish a platter of salads, grilled meat, and roast chicken. In the kitchen, I cook the whole chard plant, stems and all. Most folks rely on the leaves, but the stems add color and snap to a dish. In this simple recipe, they're sauteed first to become tender, the leaves are added next and tossed quickly, so they don't over cook. Stay with me as I relay a few of chard's health benefits -- it's loaded with antioxidants to help fight off cancer; cardioprotective flavonoids that support the immune system; and syringic acid to help regulate blood sugar (important as we transition into fall). 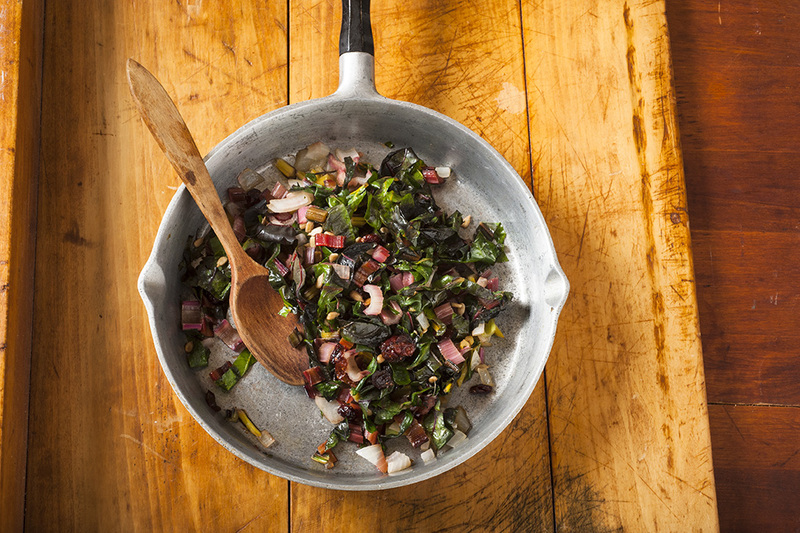 But the main reason to eat chard is that it is quick, easy, and versatile, to cook. Here's a basic recipe. Take it and make it your own. Add a dash of curry powder and splash of coconut milk; or toss in chickpeas, olives and cherry tomatoes for a warm salad; or consider a sprinkle of dark sesame oil, soy sauce and rice wine vinegar. Play with the rainbow of flavors -- cook chard. Remove the chard stems and cut into 1/2 inch pieces. Cut the leaves into 1/2 inch shreds. Heat the oil in a large skillet set over medium. Add the garlic and toss for a few seconds, then add the shard stems. Reduce the heat, add the wine or water, cover and cook for about 3 minutes, or until the stems have softened. Add the leaves, toss, cover and cook another 3 minutes until the leaves are bright green and tender. Toss in the vinegar and red pepper flakes. Then season to taste with salt and pepper. Serve warm or at room temperature.